Covert Affairs is a spy show featuring an attractive cast in exotic locations. The plot lines are fairly simple and action pretty benign. The characters are very likable and have a pretty strong following on Twitter. I suspect an intense on-the-edge-of-your-seat show like 24 might have had less active users during the show than Covert Affairs simply because 24 demanded a viewers constant attention. Covert Affairs on the other hand is completely enjoyable but is a show that works great for multi-tasking activities like checking-in or commented about how your favorite character is funny or how a particular scene unfolded. 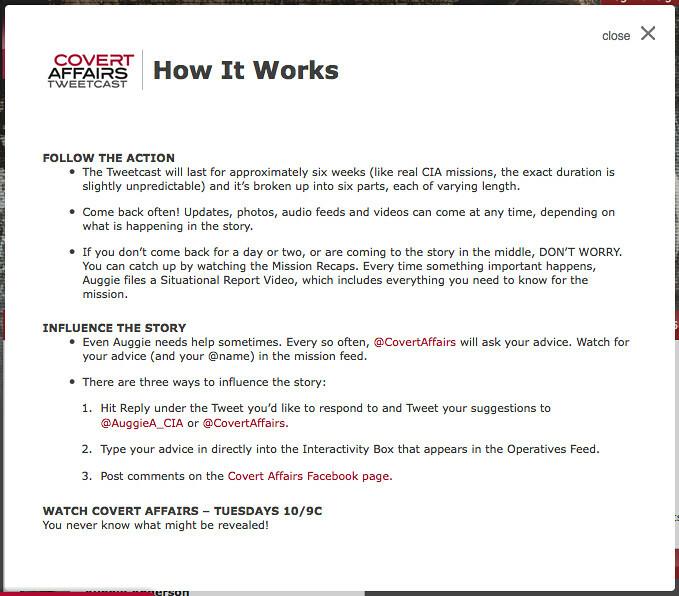 Last night’s Covert Affairs episode featured several calls to action, asking the user to participate in an online “tweetcast”. The bumper spot displayed the URL being typed into a generic browser bar (see below). This is a great tactic to get viewers to take action, because they can visualize typing in the address. The second on-air spot displayed chat bubbles for Twitter and Facebook, (screenshot below). 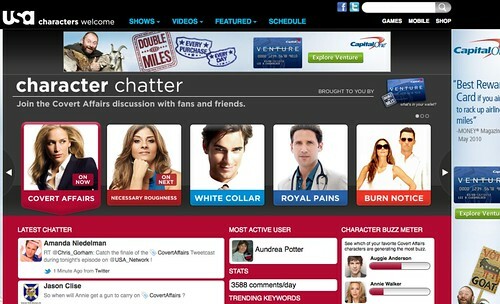 The USA Network’s website for Character Chatter features a character buzz meter, most active user, stats, the latest chatter and most importantly trending keywords. 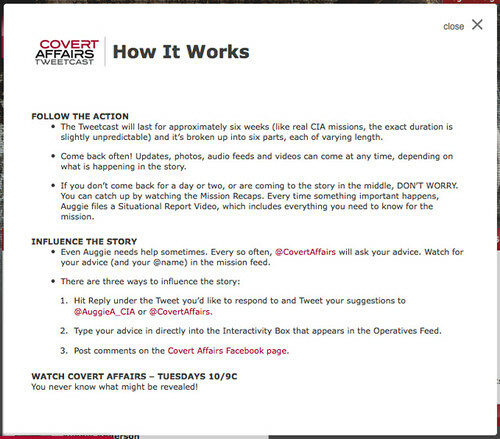 The Covert Affairs Tweetcast section of the website utilized the Twitter and characters from the show, not the actors, but the CIA “operatives” featured in the show.